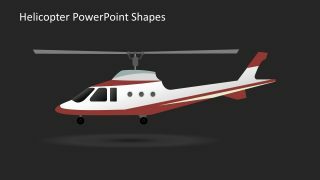 The Helicopter PowerPoint Shapes is a template for air transportation. There are many possible topics to use this presentation. Notably, police department, rescue management, ambulances, logistics, TV and Radio broadcast where helicopters are being used. This helicopter shape presents concept of medical or rescue help. Another example of air transportation is fast shipping in geographical locations such as North Pole. Wherever, it is difficult to travel or ship packages by road. The Helicopter PowerPoint Shapes is combination of PPT graphics. The shapes collectively make a chopper figure. These are editable object and users can change the features in format tab. For example, select multiple items using ctrl key. 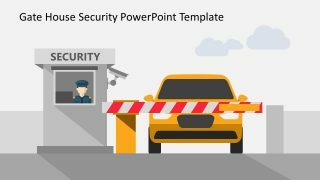 Copying, deleting or moving the objects is easy in PowerPoint. The users can also resize or color the element. To do so, in the design tab, change the colors under variants option. The variants give further options of font and object animations in effects. There is also an option to change background colors. For the full slide, animation tab has range of options such as entrance, emphasize and exit. 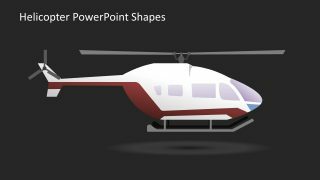 The Helicopter PowerPoint Shapes contain two slides of different helicopter style views. The first one shows a chopper with wheels and round windows at the back. Whereas, the next image has helicopter mount and square window shapes. 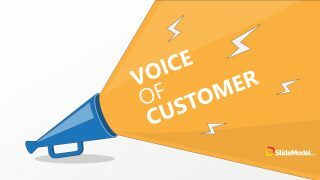 The template is professionally designed with high-resolution images and background. 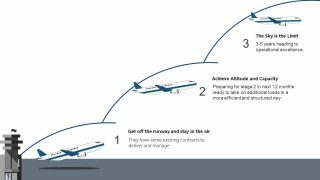 The concept of this template is to present the services of aircraft in demanding situations. Foremost important is the military air force which protects the skies of a country. The use of helicopters as ambulance, to save lives of people where vans cannot reach. A live telecast or radio broadcast of traffic and accidents in a city. Rescue services, who help in life-threatening situations, natural disasters and extreme cases behavior. It is an ideal presentation of industries dealing with aerodynamics and aviation. 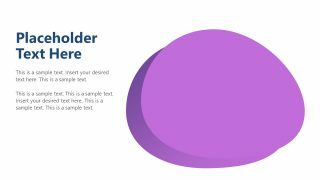 The researchers, engineers or manufactures can also relate to this modern template design.